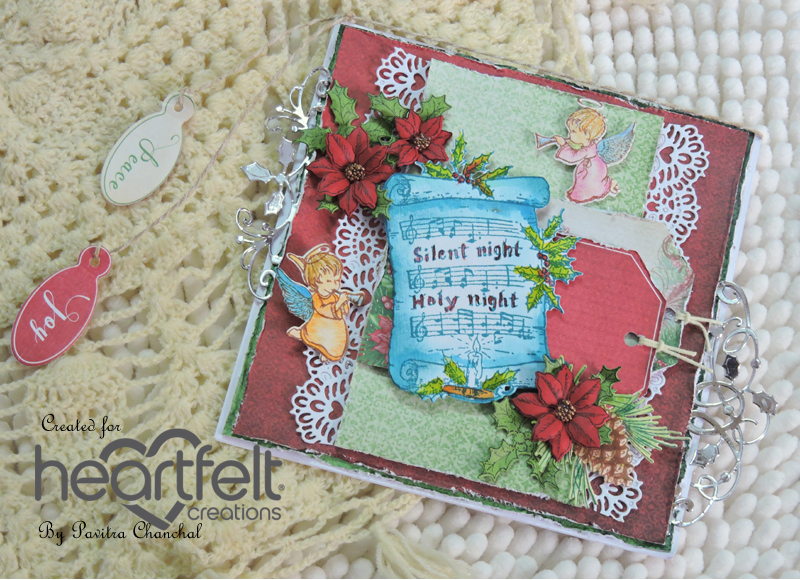 Its time for another inspiration wednesday at Heartfelt Creations and i am back with a Christmas Card created using O Holy Night Collection. 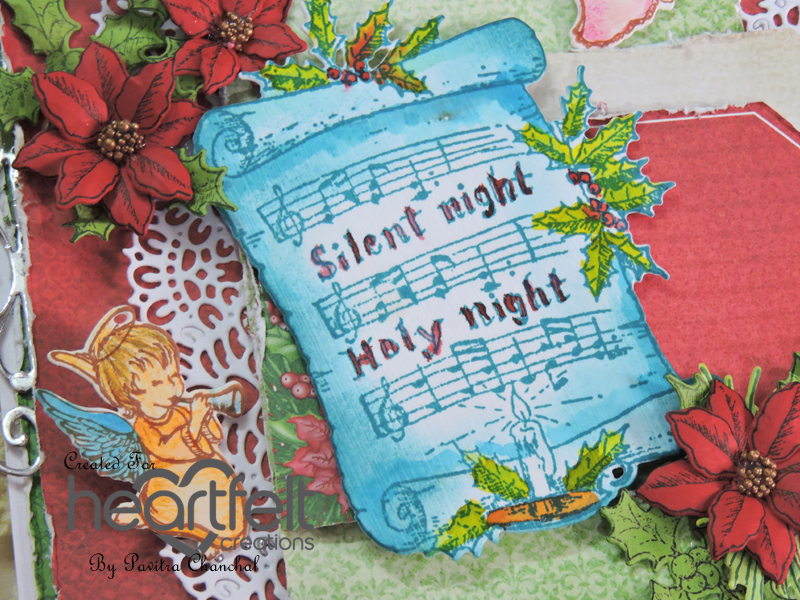 The finished card measures 6-1/ 4 x 6-1/4. Cut white cardstock 6-1/4 x 12-1/2, score at 6-1/4 from the longest side and fold. 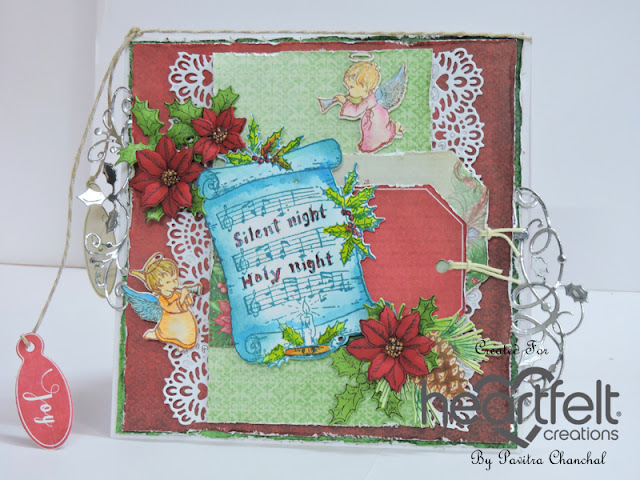 For the first layer cut green color pattern paper from the O Holy Night Paper Collection 6 x6, distress the edges and adhere on white cardstock with clear dry glue. For the second layer cut red color pattern paper 5-3/4 x 5-3/4 from the paper collection, distress the edges and adhere with 3D foam tape. 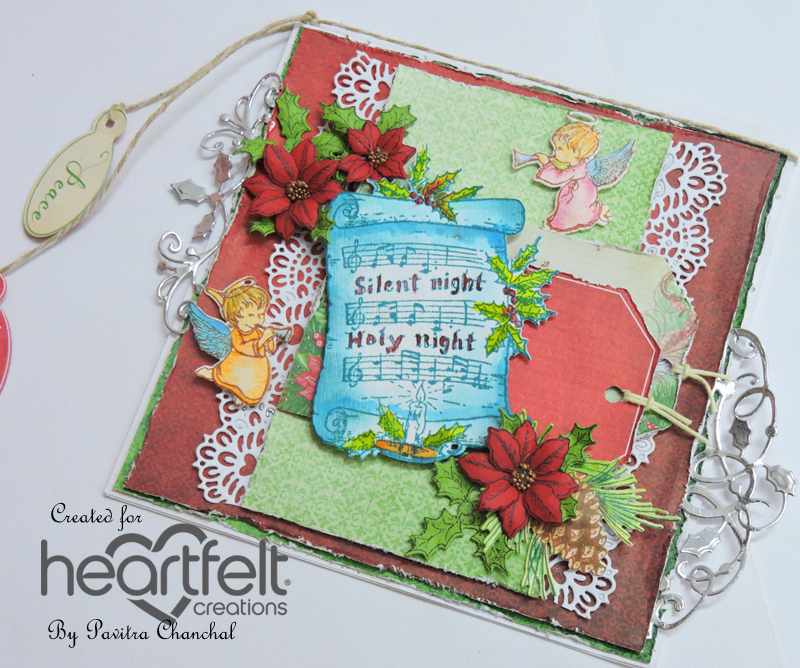 For the final layer cut light green color pattern paper 3-1/2 x 5-1/2 from the paper collection, distress the edges and adhere in the center of the card with 3D foam tape. 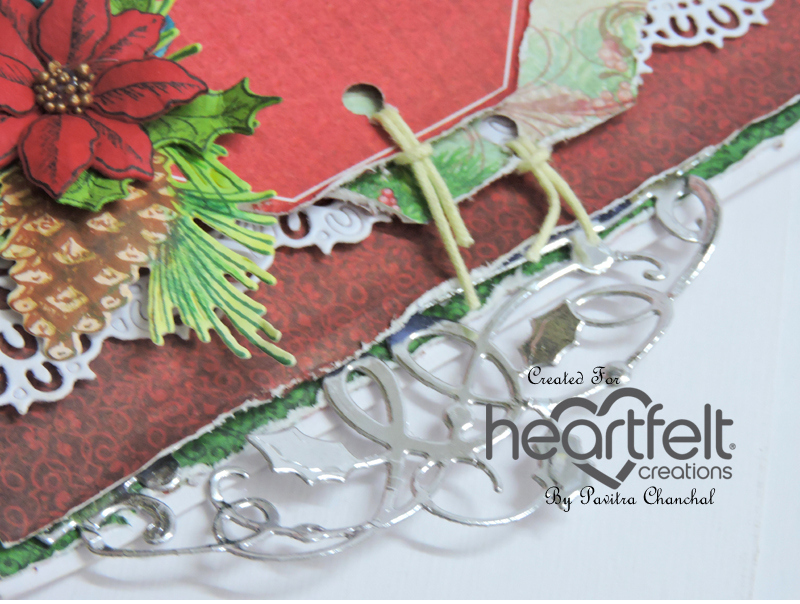 Die cut white cardstock using Sweetheart Borders twice and arrange on the sides of the center pieces as shown. 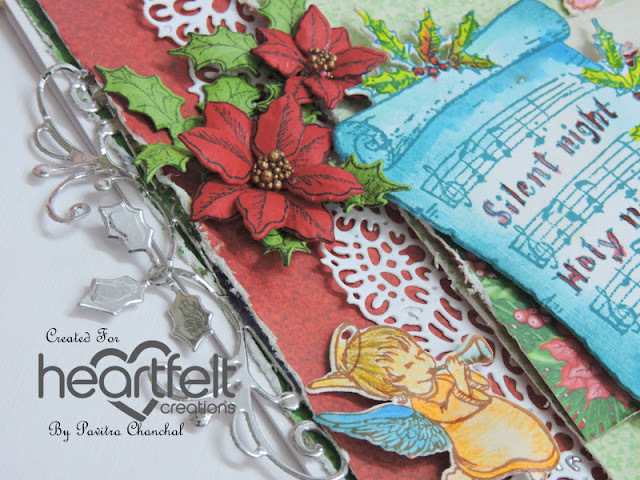 Die cut Silver mirror cardstock using the Noel Ornament die, cut it into half and arrange on the sides of the card as shown. 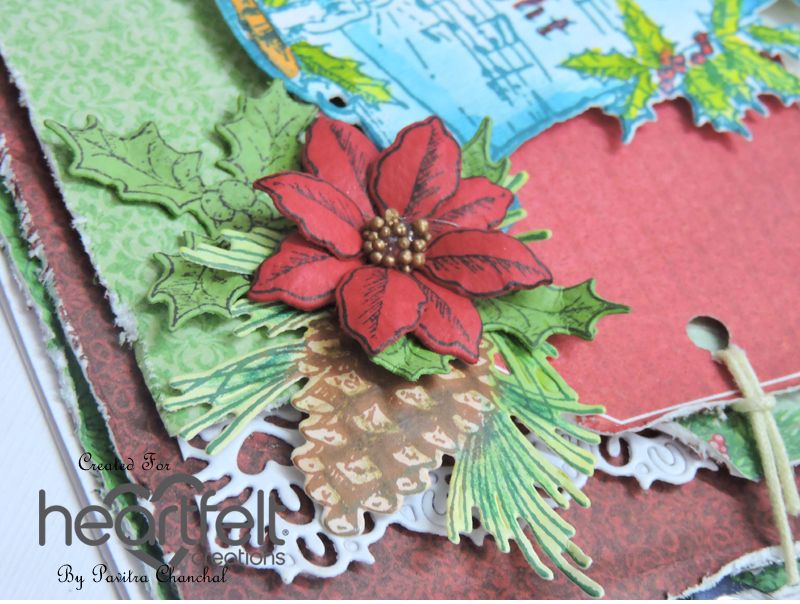 Die cut two big and two small tags out of paper collection using Luggage and Tags Die. 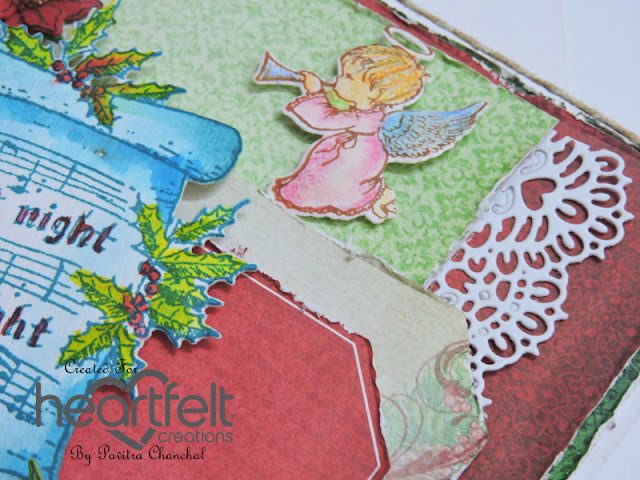 Overlap one big tag on another big tag and adhere in the center of the card .Tie small tags with the help of twine around the card. Stamp the white cardstock with angel image from the O Holy Night stamp set, die cut with coordinating die and color with pencil and water colors. Stamp red cardstock with small Poinsettia & Holly Cluster Stamp using Archival ink – Jet Black, cut using coordinating die and shape the flowers using flower shaping mold.